This fantastic convertible is a tourer with plenty of room for four adults, developed to meet the highest driving and roadholding demands, yet is specified with everything you would want when it comes to comfort and performance. The added extra with the C70 convertible, of course, is that the blue sky is just the push of a button, away. There are no latches to lock or unlock when lowering or raising the hood, no bolts to tighten or loosen: it is electrically operated and fully automatic. A hinged cover neatly hides it behind the rear seat when it is lowered and the hood is fully lined for perfect insulation, with a real glass heated rear window with demister. The function of the climate system is partly controlled by the hood. When it is up, the system works automatically and as efficiently as in any other Volvo. When it is down, the climate system automatically resets itself for manual operation, since the sensors are unable to measure correctly. To have only a black top to choose from is also a thing of the past with the C70 convertible. It can be ordered in a range of colours to match perfectly the exterior colours. As well as a choice of engines C70 customers have a number of alternatives to choose from when it comes to transmission, chassis settings and wheels. The gearboxes available are either a five-speed manual or four-speed automatic, the latter with three different driving modes Sport, Economy and Winter. To match perfectly the different engines and their levels of power, the car is offered with three possible chassis settings in Europe Comfort, Dynamic and Low Dynamic. All are comfort oriented but without the loss of any driving performance characteristics. Wheels and tyres play their part, too. The C70 convertible is shod with 225's on 16 or 17-inch wheels. Customers can opt for 225's on 18inch wheels if they so desire. Inside the car, Volvo's Scandinavian heritage is clear to see. Light colours over clean, uncluttered surfaces and shapes transmit a genuine impression of quality. There are also huge combination of fabrics, leather and colours. Both the C70 convertible and the coupe feature what is probably the most advanced and sophisticated sound system on the market today. Ten loudspeakers are offered as standard, with 12 or 14 available as options, and are fitted to the car in production, to ensure perfect fit and high quality. Amplifiers are available as 4x60w or 4x100w. The radio features Volvo's unique 'big front' with anti-theft code, fulfilling all Volvo's requirements for safety, ergonomics, styling, quality and reliability. It comes in two types, the SC900 or SC805, and is one of the most advanced RDS radios on the market. The SC900 has an integrated three CD changer and auto reverse cassette deck. The radio has NEWS and RadioText, with remote control and a six CD changer as options. Another exciting option is a world's first in a car - the Dolby™ Surround Pro Logic™ system, with a built-in amplifier for a central speaker. VOLVO has chosen not to build a convertible for forty years because an open car can never be as safe as one that is closed. The high technical quality at the company today, however, means that it is now possible to build a car that offers drivers not only enjoyable, but also safe open-air motoring. The C70 convertible has a structure based on the 850, with its two-door body having high torsional rigidity, plus a number of specific innovations, collectively known as ROPS (Roll Over Protection System) to protect occupants during a roll-over accident. For rear seat passengers, pop-up bars rest neatly behind the rear seat head restraints. As the name suggests, these pop up above the passengers' heads, so holding the car off the passengers if it rolls. Front seat passengers are equally well-protected by the sturdy A-pillars and windscreen frame which, reinforced with a special alloy steel, also form a roll bar. To ensure that all occupants are safely belted in the correct position in case of a roll-over, the car features pre-tensioners on all four seats that, in most roll-over situations, will eliminate any slack in a fraction of a second. Interacting with ROPS is the SIPS system with its twin airbags and the ordinary front airbag. Although they may look different, the extremely strong door, sills and B-pillar are all parts of the SIPS system like other Volvos. Adding greatly to the overall high level of safety is the 'horseshoe'. 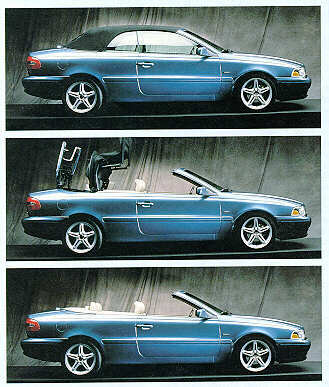 Since the roof is a vital part of the SIPS system in other Volvos, another solution had to be found for the convertible. The horseshoe is a U-shaped structure which embodies the passenger compartment, absorbing and distributing crash impact energy together with the floor and SIPS box. But it's not just in roll-over or side impact accidents that the C70 convertible excels. It incorporates the highest possible levels of safety for all eventualities.